Renee, Yvonne, Sara and I decided to do a mini quilt swap using Moda Ombre Basics by V & Co. I chose a Nancy Cabot throw-back to 1935 quilt block called Cocklebur. I mean, how can you go wrong with something named after a weed? I wanted to the colors to transition diagonally. Except, the reversing phenomenon of paper-piecing made things go a bit awry given that I had labeled my color plan on the paper-side, resulting in the need to build the top face-down. The arcs were paper-pieced; then I assembled the curved seams traditionally. I made the bold decision not to use blending thread colors. Instead I pulled colors from the piecing to select thread hues for the gray background. I echoes 1/4" around the piecing and then did whatever fills struck my fancy at the time. 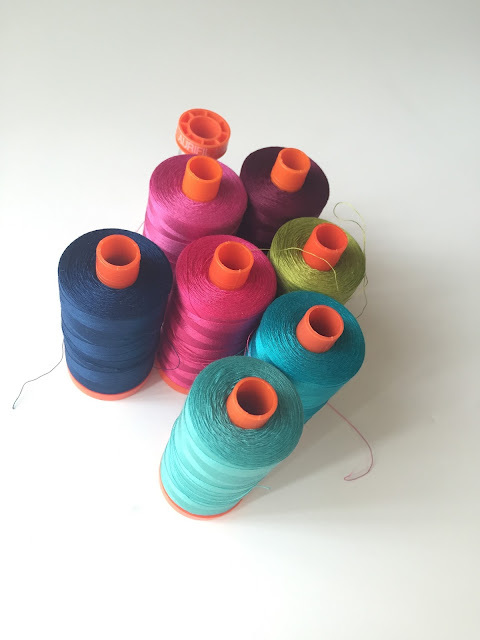 I used Aurifil 1148, 2810, 2783, 1147, 4020, 2588, 4030, 2615. 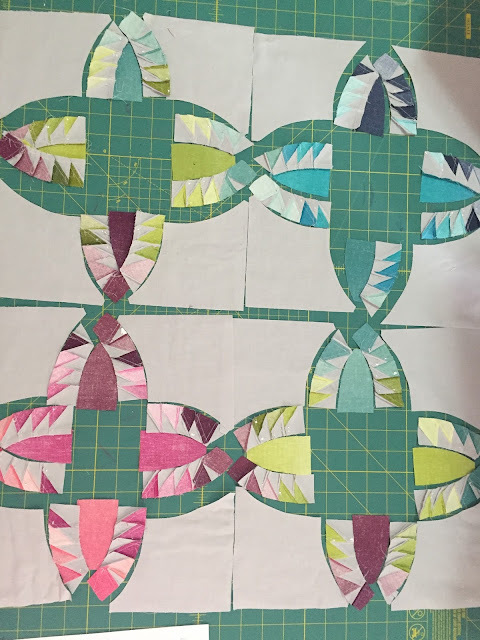 In retrospect, I should have started by stitching in the ditch around the pieced shapes because my crisp points got a bit lost in the puffiness of the less-densely quilted areas. I would have also selected only free-motion designs that did not require any back-tracking, as this drew unwarranted attention to certain areas of the quilting. For the binding, I used a Benartex ombre that I had in my stash to emphasized the raimbowy goodness. I chose a neutral gray thread for the bobbin, so that I wouldn't have to keep changing it, and it would go unnoticed from the front side. The backing was so busy that you would really have to work to see the quilting. In return, Renee made me this star-struck beauty, which I love everything about. Your piecing was so beautifully done, Afton. 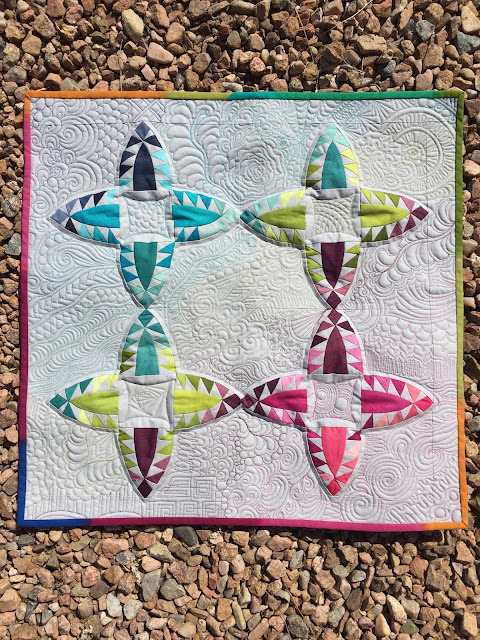 I loved everything about this swap and especially enjoy how well all the quilts coordinate but how different they each are. I'm so happy this is mine!! Beautiful quilting and they all look fantastic! So gorgeous, and they all look fantastic on that line, all together. I love that quilting, and the story. But ay yi yi! that teeny piecing should earn you a Gold Medal in Quilting award. Wow, your mini is amazing! They look great all together, 4 very talented ladies! Love your Cocklebur piecing. Have used your Small Wonders pattern several times -- it is loved by all recipients. Thank you. 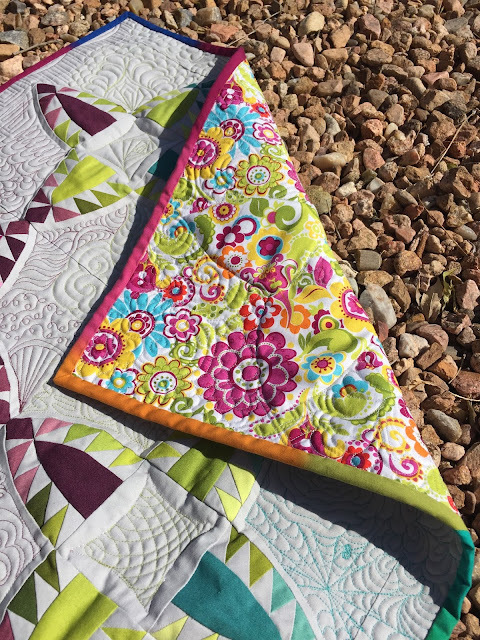 Love me some ABQ paper piecing goodness!